A few months ago I was fortunate to be selected as a Google Glass Explorer though the company’s #ifihadglass campaign and last Saturday night I finally picked them up at Google’s San Francisco office. I thought it was time for a brief review of what I have learned so far. My week with Glass started out with an evening cable car ride and has included both the mundane (trips to the grocery store and Target), as well as a bit more exciting adventures (hiking with my nephews in Muir Woods). For those of you who are Facebook or Twitter friends you have seen many of my posts and I have been slowly uploading some of the digital content to this Flickr set. Being a Glass Explorer is definitely all about learning, reflecting, and answering a lot of stranger’s questions. Over the past six days I have been stopped numerous times with them on and have more than once caught someone staring at me. I find that most people don’t even notice they are on my face, which is quite odd because they do kind of stick out. However, when people ask me questions they are usually curious if I work for Google or if I am recording them. The answer to both is a definitive “no.” Interestingly, when I explain what they are or have people try them on adults are always amazed and kids usually ask, “What else does it do?” Kids expect a heck of lot more from these devices. Over the past week I have found that my thoughts and explanations continually fall into two categories. Augmented Reality – Contrary to some of the Glass commercials and a few online write-ups, Glass does not provide an augmented reality experience…yet. And I think yet really is the keyword. Currently, you can’t look at a building and ask Glass to identify its name or location. Similarly, Glass does not provide you turn-by-turn directions layered over your current view. You can easily ask Glass to look up information (similar to Siri on an iPhone) and if you have an Android phone the My Glass app will provide GPS-like navigation similar to the device in your car. Considering these features I have a feeling more augmented reality elements are just a few updates away. We’re almost there. A Replacement for Your SmartPhone – Glass will not replace your smartphone anytime soon. For all of the device’s features to work Glass needs a data connection. If you are in a wireless environment you can easily use that network, however when you are walking around town or driving in your car you will need to use your phone’s data connection. Additionally, at the moment you smartphone has a million different apps that are not available for Glass. An Invasion of Your Privacy – A few hours after picking up Glass I happened to walk past a store in the Fisherman’s Wharf area with a sign that read “Google Glass is Banned on These Premises.” Ironically, this store sold spy equipment. I presume this sign was posted simply because the staff did not want any surreptitious pictures or recordings. Here’s the deal – in order to take a picture or record a video you have to either speak a series of very obvious commands (“Ok Glass. Take a picture) or tap and swipe on the side of your temple multiple times. Additionally, the clear viewfinder lights up. If anyone really wanted to snap a picture or record someone without another person knowing they would just use a cell phone. Glass is way too obvious. For example, check out this iPhone app, SneakyPix. I do hope though that Glass helps propel a national conversation about privacy in the digital age. However, cell phones, ATM surveillance cameras, and the data you’re providing for a 10 cent discount on bag of Doritos at Safeway are much more of a privacy concern than Glass. Matt Honan actually had a nice article about this very topic earlier this week in Wired. Amazing – It might not seem like much at first, but the fact you can have something within your field of view that provides a wealth of information and allows you to easily capture the world around you is brilliant. While your smartphone does a whole lot more, I am finding that there is something to be said for not having to look down or stop your conversation. Handy for Snapping Pictures and Video – Right next to the eyepiece Glass has a built in 5 mega-pixel camera that can also record HD 720p video. It seems to work pretty well both during daylight and evening activities. As I mentioned, for those who are interested I started a personal #throughglass set on Flickr. Looking into the future this is probably one area I would like to explore. Natively Glass allows you to share photos to Twitter, Facebook, and Google+ while videos can be uploaded to Google+. Fullscreen Beam developed a tool for uploading them directly to YouTube and it works pretty well. A Nice Tool for Receiving Twitter and Email Notifications – When someone tags me in a tweet or sends a direct message or email Google Glass provides a nice chime letting me know there is a message waiting for me to read. With one tap on the side of Google Glass the message is there for me to read. I am finding this much more convenient than looking at my phone. My Grandfather’s Commodore 128 – I have had a few moments this week where people have said, “Really, that is all it can do.” Today we live in a world where we expect technology to do everything our current devices do and more. Google Glass isn’t there yet, but every time I hear or read someone’s comments about the limitations of Glass I am drawn back to the first time I saw a computer in the mid-1980s – my grandfather’s Commodore 128. It couldn’t do much either, but look where we are today in terms of personal computers. 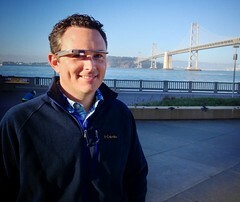 To me Google Glass is in a similar place. The technology is in its infancy, a community of developers are inventing new applications for the hardware, and I am personally excited to see what develops. For example, this week through post on Twitter I discovered a way to use Google Sky with Glass. I’m looking forward to testing this out. Over the next few months I will be posting more here about my own discoveries with Google Glass. However, if you are curious how others are using Google Glass check out #throughglass or #googleglass hashtags on Twitter, Google+, Flickr, Instagram, and even Flipboard. Feel free to post any questions or ideas you have in the comments section below.